Some people are naturally enigmatic, which can make it challenging for others to understand them. This can be a struggle throughout the lives of the enigmatic person, but it certainly makes them their own special individual. There are also others who are more simplistic and who lay everything out there for the world to see. 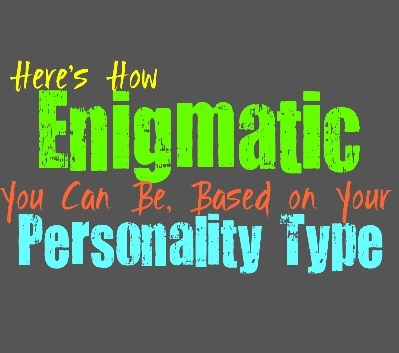 Here is how much of an enigma you can be, based on your personality type. INFJs are definitely enigmas, even without intending to be. They are one of the types who possess so many layers to their personalities that is can take a long time to truly understand who they are. They are also somewhat guarded people, so it can be difficult for them to completely open up to others. INFJs want to find someone who will take the time to learn who they are and to discover the many layers of them, but at the same time they have a hard time trusting. ENFJs can certainly be enigmatic people, with more complex qualities than people realize. ENFJs often want people to think they are more open than they actually are, since they don’t like to upset people. They express parts of themselves but there is often so much more beneath the surface. Because of this ENFJs definitely are enigmas, it just won’t be that obvious to the people around them. They care about people and want to feel connected, but at the same time it isn’t easy for them ot open up. INFPs are open and honest people, but they are rather complex. They try to be upfront about their feelings, but they run so deep that it isn’t always that simple. INFPs express themselves but it often takes time to process everything for them to sincerely open up in the way they want to. They often feel like others don’t completely understand them, but the INFP wants this more than anything. They try to find ways to unfold who they are, and this is important to them. ENFPs definitely see themselves as a bit mysterious, and this is because they do possess so many layers to who they are. ENFPs appear very open, but there are often parts of themselves they keep hidden or are simply afraid for others to see. They are friendly and kind to those around them, but rarely do they feel truly understood. Even the people the ENFP loves can be kept at a distance, and it often takes a lot of time before they can feel truly at ease opening up to them. INTJs can often feel like an enigma, but they are pretty honest people. They possess certain complex qualities, but at the same time their goals and their desires are pretty easy to understand. Where the INTJ becomes misunderstood, it is simply because people aren’t taking the time to truly listen to them and who they are. INTJs aren’t great at expressing their emotions, but they are sincere and caring people. They simply believe in a sense of privacy and don’t feel like sharing parts of themselves until they fully trust someone. ENTJs are definitely complex people, but at the same time they are also fairly open. They believe in going after their goals and don’t let anything stand in their way. What the ENTJ wants and desires is not something they are afraid to be open about. Where the ENTJ can seem like a bit of an enigma, is the way they can have a hard time understanding their own inner emotions. They care about their loved ones, but they often struggle to truly express this in the way they might want to. INTPs are definitely enigmas, and often very difficult for others to truly understand. They often crave the feeling of being understood by someone, but at the same time they struggle to open up completely. INTPs can often contradict themselves without meaning to, which definitely causes them to be an enigma. They want to be heard but at the same time they need so much time by themselves to process things. INTPs are often mysteries even to the people who have known and loved them for years. ENTPs are definitely enigmatic people, even though they often appear more open than they are. They have a hard time truly opening up their feelings to those around them, since they often don’t even understand them themselves. ENTPs are complex people who have many desires, and this can cause them to bounce around a bit. At the same time they want to be grounded in some ways and make real connections, which makes the ENTP even more of a complex enigma. ISTJs aren’t often seen as enigmas since they are very upfront and honest people. They enjoy the more simple things in life and often become annoyed when others have to complicate everything. ISTJs are who they are without feeling the need to hide this or become more complex than they naturally are. They aren’t really fans of mysteries, and are more inclined to be upfront about who they are and what they want. ESTJs aren’t really enigmatic people, simply because they are upfront about who they are. They prefer to keep things sincere and honest, instead of hiding the details of who they are. The ESTJ often goes after the simpler things in life, and wants to go after the things they want in life. They also want to provide for and protect their loved ones at any cost. ESTJs aren’t really enigmas, although their emotions can be a bit difficult for them to understand. ISFJs often prefer to simpler things in life, and aren’t always the most enigmatic people. They prefer to be upfront about who they are and what they want. Their biggest desire is to take care of their loved ones and keep a sense of peace in their environment. ISFJs don’t need to hide this and so their goals are often pretty evident. They don’t often feel misunderstood by their loved ones, since they strive to connect with them. ESFJs don’t often seem like enigmatic people, since their goals can be a bit evident. Their main desire is to provide for and take care of their loved ones, and this is something they want others to know. ESFJs don’t like hiding things and are often fairly honest with the ones around them. This helps them to be easier to understand, even though there are times when they might feel like the deeper parts of themselves aren’t easily understood. ISTPs are pretty laid back and upfront people, but at the same time they can seem a bit enigmatic. They are often seen as mysterious to others, and hard to truly understand. While ISTPs are fairly honest people, they simply aren’t the most open around others. They often prefer to keep parts of themselves quiet, since they don’t like having to share too much with others. ISTPs can be hard to understand mostly because they put up walls and keep to themselves. ESTPs can be somewhat mysterious people, but this is often intentional. Deep down they have simple goals, and just want to experience life to the fullest. They don’t like being held back and live very much in the present moment. They aren’t all that complex, they simply don’t find it easy to open up to those around them. ESTPs aren’t overly emotional people, but they do possess a strong desire to connect with their loved ones. ISFPs are not all that enigmatic, since they prefer to be open and honest. They follow their heart and that is honestly the most important thing for them. They desire to experience the world around them without having to be held back by others. ISFPs don’t always feel easily understood by others, but that is simply because they want to find the right ones who they can connect with on a deeper level. While ESFPs do have more complex sides to them, they really aren’t all that enigmatic. They are loving and kind people, who simply want to experience the joy in life. They live in the present moment and believe being there to share the moments with their loved ones. ESFPs care about the people in their lives and will do anything they can to connect with them.